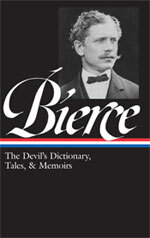 Certain aspects of the story echo Bierce’s own life—particularly the themes of suspicion and infidelity. His wife died in 1905, only months before their divorce had been finalized, and he wrote the story the following year (it was published in the January 1907 issue of Cosmopolitan). The couple had permanently separated two decades earlier when he found letters to her from a Danish man with whom she had become friendly. According to their daughter Helen, the long-distance friendship was never romantic but rather “a decorous and discreet fascination.” But Bierce walked out and never saw her again: “I don’t take part in competitions—not even in love.” Soon after their separation, a far more tragic love triangle occurred. Their seventeen-year-old son Day shot and killed his best friend, and then himself, after the latter had eloped with Day’s girlfriend. I am the most unfortunate of men. Rich, respected, fairly well educated and of sound health—with many other advantages usually valued by those having them and coveted by those who have them not—I sometimes think that I should be less unhappy if they had been denied me, for then the contrast between my outer and my inner life would not be continually demanding a painful attention. In the stress of privation and the need of effort I might sometimes forget the somber secret ever baffling the conjecture that it compels. At the time of which I write I was nineteen years old, a student at Yale. One day I received a telegram from my father of such urgency that in compliance with its unexplained demand I left at once for home. . . .If you don't see the full story below, click here (PDF) or click here (Google Docs) to read it—free! I enjoy the e-short stories very much. I usually have several books going at once. It is nice to be able to finish a story at one sitting. Thank you for your continuing efforts to bring literature to the busy. Chilling story!I enjoyed it. Thankyou so much.